Every time I turn around, I swear I find another dirty dish, another mislaid toy. They echo of family, and life, and the Grace of God. I hope you enjoyed your holiday weekend. The guys are moving hay around, preparing for the day when the cows will have to be fed. 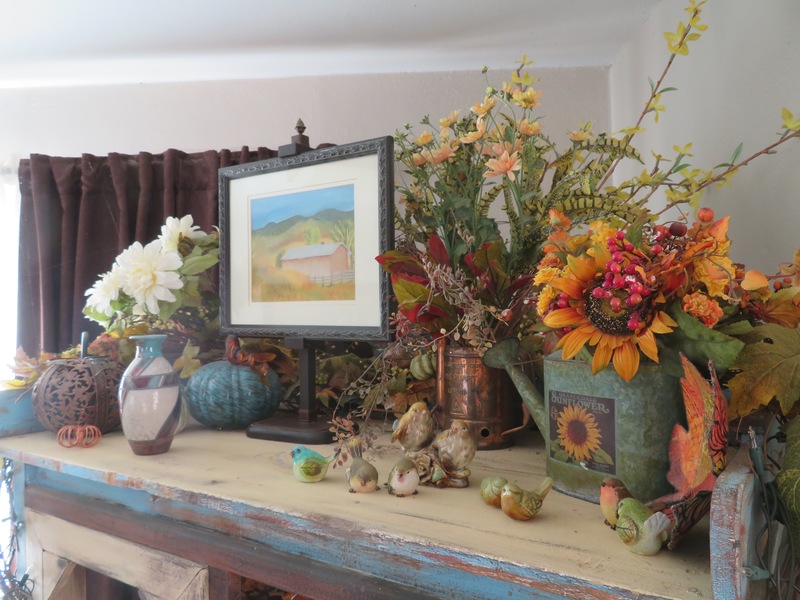 I cleaned my house some more… and held off Christmas decorating for one more day… enjoying my fall colors, grasping at the warmth that December will soon leave behind. Darkness comes early, and I yearn for more of the sunshine’s golden yellow, but admit to the side of me that will revel in the icy blue that comes with snowflakes and frigid air. When air burns your lungs and freezes your nostril hair. When snow squeaks as you gingerly trudge to do morning chores. When diamonds sparkle on barbed wire, and weak light paints the world in blues and purples. When close sounds are muffled by mounds of snow, but the call of an eagle carries for miles, or the lowing of cattle, or the slamming of a pickup door. When closed eyes and upturned face beg for you to add an open mouth and stuck-out tongue to catch every possible snowflake you can. When the sky is so clear and stars so shimmering and so profuse that it hurts your heart. Autumn has passed and I gingerly open the door to winter, peering into the cold and dark, with the beginning of a smile upon my face. Lovely prose, indeed! I always vote for the “four seasons” which brings delight to our senses no matter what. I have always lived in norther and western NYS where we really do have ideal weather for folks like me. I bet most of your other readers will not agree with me, that winter in their favorite season!! Winter-fall-spring-summer in that order for most of my family too. Go figure! And thank you for the latest Red Dirt in My Soul calendar. It came today and looks wonderful. Lucas on the cover is very special. Marilyn, thanks so much for purchasing a Red Dirt calendar! I appreciate your support through the years. smiling quietly, remembering. Thank you. Beautifully written. Beautiful prose. Ah the images you paint with a few well chosen words! How can one live without reading? Thanks for starting my day with my heart filled with wonder! Sowing here this morning. I too like winter and just tell those who don’t, that spring is on it’s way. For the first time in many years I am waiting with both trepidation and excitement for all those sensations you describe of Winter. I am living in snow country once again, though there’s no snow on the ground yet. I expect a snowy long winter here in northern Idaho and the days are very short already. I’m up in a mountain valley and the hill hides the sunshine very early when it shows at all. There’s supposed to be snow tonight, but it’s only rain yet. I’ve been told that it usually sticks much nearer Halloween. I remember from childhood the icy blue, the bright nights, the muffled sounds, frozen (wet) hair on the way to the school bus, and so much more in MN. I am hoping for northern lights here. I know they show up here, but I’m afraid the trees might hide them. My best view is south, not north. I don’t like Fall, but Winter is closer to Spring and this year could be quite exciting for a while, with my nephews and niece experiencing long lasting snow at home for the first time. A snowy Winter’s saving grace is it’s incredible beauty. A lovely autumn display Carol. Keep warm. We are expecting frosty mornings this week.